Taken from Interweave Crochet Magazine - '11 Spring: An exquisite pattern, deceiving in complexity. 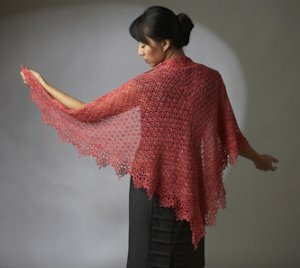 Once you establish the first few patterns, the body of the shawl is quite easy to memorize and to take with you anywhere to work on! This pattern is in Interweave Crochet Magazine - '11 Spring, page 23. Size US G crochet hook are required but not included. Finished Bust Measurements: 70" wide and 35" tall. Color Shown is #Rosetta Pink.